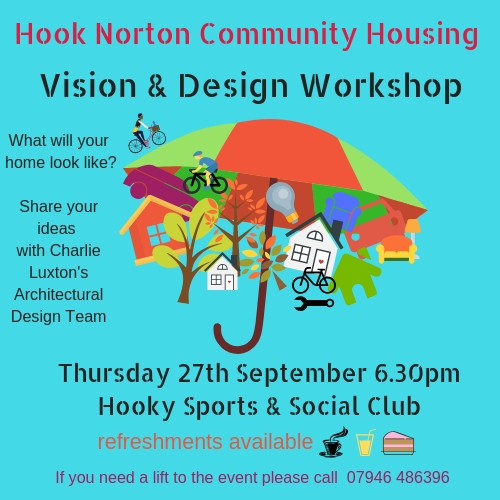 In September 2018 the 37 people interested in living in the community homes were invited to participate in a vision and design workshop with the team at Charlie Luxton Design. 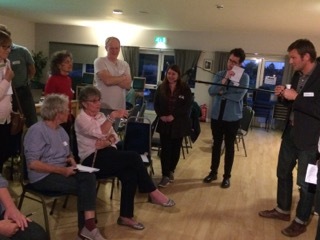 The event took place at Hooky Sports and Social Club and was a creative and lively evening where the community and designers collaborated on ideas that will inform the initial design and layout of the site. the atmosphere was vibrant and stimulating, culminating in a dynamic exchange of views that were captured on film by antenna films for inclusion in a possible documentary on community led housing. In august 2018 four local architectural practices were invited to submit expressions of interest to develop the next phase of the community housing project and were interviewed by members of HNLC and the Low Carbon Hub, Oxford. Each practice presented conceptual sketches of how the site might potentially look and discussed how they might approach engaging the community to contribute their ideas to decide the size and shape of the homes and their surroundings. all four bids were extremely impressive in different ways but it was unanimously decided that the team at Charlie Luxton designs had the most imaginative and versatile approach and they were selected as the project architectural designers. They had great ideas for the sustainability requirements as well as the communal aspects of the build and were excited about the prospect of working directly with the local community. The results of the survey in April 2018 delivered a positive message of support for a community housing project in hooky that will provide affordable, sustainable housing for those in need with a strong local connection to the area. From the respondents 37 people indicated that they would like to live in the homes, which will be designed according to the needs of the community. A second more detailed survey was completed by this group to ascertain the level of need for affordable housing in Hooky and to determine the different types of tenure to be available. as a community led project, all prospective occupants were invited to a workshop with the project architects to contribute ideas to the layout of the site and the design of the homes and communal areas. watch our short film below and see what your friends and neighbours say about affordable community housing in hook norton. © Copyright 2019 - Hook Norton Low Carbon Ltd.